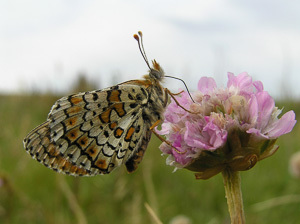 The Glanville Fritillary (Melitaea cinxia) can be found along many stretches of the Island's southern coastline, especially where the cliffs are slumping and landslips are annual as this provides the right conditions for growth of new young plants of Ribwort Plantain (Plantago lanceolata), on which the female lays her eggs. Colonies exist primarily on sandstone and clay exposures of the undercliffs and chines and on the cliff-top grassland above. The colonies on Mottistone and Compton Downs are on chalk downland. Please note that the majority of Glanville Fritillary sites are on National Trust land, where it is illegal to collect any of the life stages. Collecting is also highly damaging, particularly when populations are at a low ebb. Look for Glanvilles during warm, sunny weather, with no more than light winds (adults hide in the grass on dull, windy days). Search for butterflies where there is a good supply of flowers for nectar. 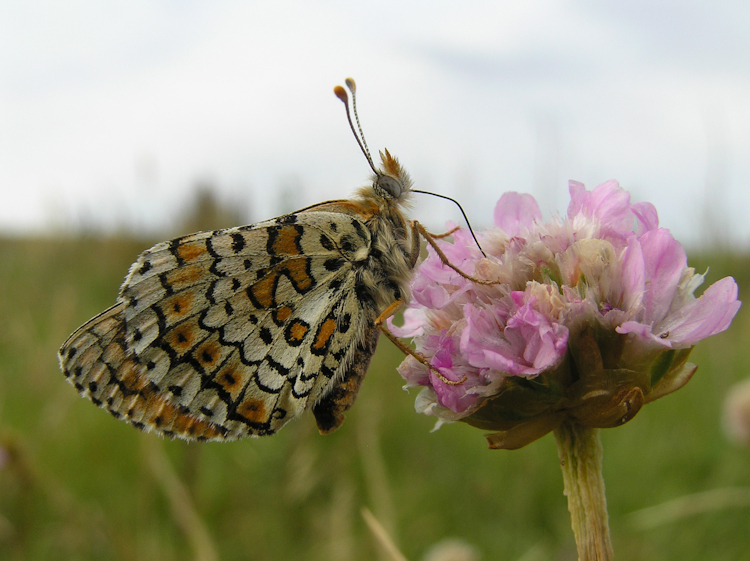 Thrift (Armeria maritima), Bird's-foot-trefoil (Lotus corniculatus), Kidney Vetch (Anthyllis vulneraria) and Red Valerian (Centranthus ruber) are favourites and adults can be closely approached when feeding. Flight is fast with whirring wingbeats followed by graceful glides low over the vegetation. Males are quite conspicuous as they patrol in search of females, which spend long periods resting in the grass. Mating occurs around midday. The female lays batches of eggs on the underside of leaves of Ribwort Plantain. She selects small, young plants growing in abundance in open, sunny ground as such conditions provide the warmest microclimate. 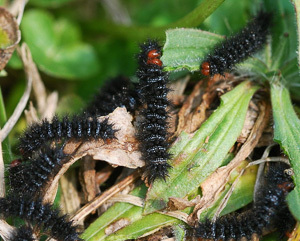 The caterpillars emerge from hibernation in mid-March, or as early as mid-February in mild springs. They feed communally in a silken web spun over the foodplant and are black with spiny black body hairs, tiny white spots and a rusty-red head. As they grow, they become extremely conspicuous and can be seen basking on the outside of the web. By late April, many larvae are fully grown (25 mm long) and disperse, when they can be seen crossing cliff-top paths. Populations undergo cyclical fluctuations. A poor year may be due to unfavourable weather, a high rate of larval parasitism, lack of foodplant causing larvae to starve to death, or any combination of these. Numbers will gradually build up again after a crash and cycles last five or six years. There are thought to be 5-8 core colonies, which hold permanent populations and at which several hundred butterflies can be seen in a good year. During bumper years, Glanvilles form transient colonies elsewhere along the southern coastline and further inland, even reaching the northern coastline. In a 'normal' year, Glanvilles are usually on the wing at most sites by 20th May and the peak flight period is the last week of May and the first week in June. At the end of the peak, numbers usually decline fairly rapidly but Glanvilles may be seen throughout the month and sometimes into July. However, emergence depends on the onset of spring and if spring is early and warm, the first adults will fly at the beginning of May or even in late April and the flight period may then be virtually over by the end of May/early June. Prolonged poor weather in June is likely to curtail the season. 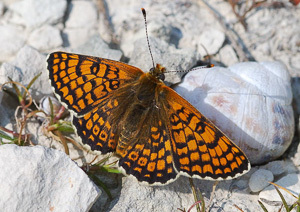 Note than Glanvilles inhabiting the sheltered, southeast-facing Ventnor coastline may emerge two or three weeks earlier than at other sites and are more frequently seen in early May. ** this is an exceptionally early date and followed a mild winter and a very warm start to April. 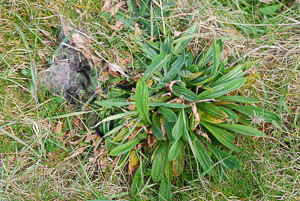 Usually the site where the first Glanvilles are seen each year due to its sheltered, southeasterly aspect. The flight period is also long here, with the first and last individuals coming from this site in many years. Eastern Esplanade car park (east of Oceanblue Quay), SZ 565 773, is the nearest. Parking also available in Ventnor town centre and at Shore Road, Bonchurch. No. 3 route from Ryde to Ventnor and Newport to Ventnor. Wheelers Bay and Horseshoe Bay are reached by heading east along the seawall from Oceanblue Quay. Glanville Fritillaries can be seen from the seawall, flying around the vegetation on the sloping banks and on and at the base of the cliffs. Dingy Skipper, Clouded Yellow, Common Blue; Cream-spot Tiger; Wall Lizard. From the mainland. Easiest route if coming for the day without a car is via the Lymington to Yarmouth ferry, then the No. 7 bus to Freshwater, change at Freshwater and get the No. 12 bus to the Hanover Point bus stop next to the National Trust car park. Alternatively, catch the open-top Needles Breezer bus from Yarmouth to Freshwater Bay and either catch the No. 12 bus from here or walk along the cliffs to Compton Bay and Shippards Chine. Note that there is a taxi rank outside the Yarmouth ferry terminal. Ice-cream van and toilets at the Hanover Point car park. From the Hanover Point car park, head west along the cliff-top path. 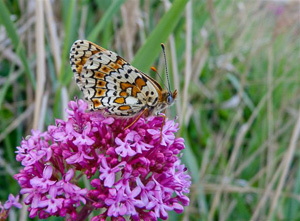 Glanville Fritillaries can be seen anywhere here. 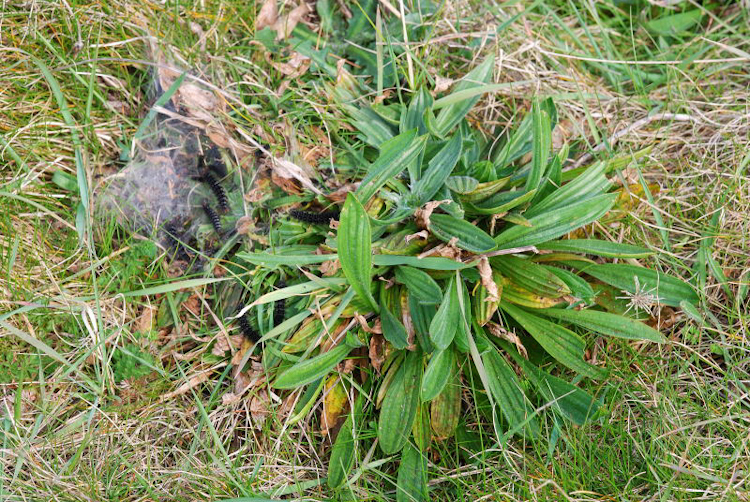 Especially check the areas with Thrift. A profitable route is to continue west along the cliff path until reaching the A3055 Military Road at SZ365854. Turn right/east and walk alongside the road for 150 m until you see a small car park in an old chalk quarry on the opposite side of the road (at SZ367854). This is one of the best sites on the Island for butterflies. Grizzled and Dingy Skippers, Green Hairstreak, Small Blue, Adonis Blue (on the slopes just above the quarry) and Wall can be seen here. (Beware Brown-tail Moth caterpillars, which can give you a nasty rash if they come into contact with your skin!) The nearest bus stop to this small car park is at Compton Farm. Small Copper, Common Blue, Wood Tiger moth; Bee and Pyramidal Orchids, Hoary Stock. At Freshwater Bay: Freshwater Bay Tearooms, the Holiday Fellowship Hotel cafe (stunning views), Dimbola Museum and Galleries tea room (home of the 19th-century photographer Julia Margaret Cameron), the Albion Hotel bar and restaurant, Sandpipers Hotel restaurant and Fat Cat bar. This is an excellent stretch of coastline for seeing Glanvilles. National Trust car park at Brook Green (SZ385836) and car park at Chilton Chine (SZ409822). The No. 12 bus goes to Brook Green but there is no bus to Chilton Chine or Marsh Chine. Tea room and toilets at Isle of Wight Pearl just east of Chilton Chine. Red Squirrels at Fort Victoria Country Park ( http://www.fortvictoria.co.uk ) between Yarmouth and Freshwater on the A3054. Can be seen in the woods at the country park and on the bird feeders outside the Model Railway building. Ranger's office with information leaflets. The Ventnor Wall Lizard colony is the oldest and largest in Britain. Documentary evidence is lacking but it may date from an introduction in 1841. The colony has now spread into Wheelers Bay. The lizards live in the cracks and crevices in walls. Look for it in sunny spots on logs or walls. Special â€˜Wall Lizard walls' have been constructed for them in La Falaise car park and at Ventnor Botanic Garden.